In 2016, online sales during the Black Friday week increased to an estimated £6.5 billion. This Black Friday, £1.74 million is the predicted online spend every minute in UK. The day opens opportunity to promote brand awareness through offers and discounts before holiday shopping seasons such as Christmas and the New Year. Before Black Friday, advise your web service administrator on the potential significant increase in traffic to your website. Utilise social media platforms as a way to engage with new audiences and loyal customers about your Black Friday promo. Optimise email campaigns for multiple devices, especially for mobile. 52% of search engine users instantly click on Google Shopping results or Product Listing Ads (PLA) instead of going directly to a brand’s site or searching on Amazon/eBay. Offer rewards to loyal customers and entice new customers through deals. Use third party sites to advertise your promotions. This year’s Black Friday event sees shoppers all over the world rushing online to take advantage of the annual frenzy. It has become more of a race to make the most of the event’s promotions, being very important for every eCommerce site to benefit from – but if you haven’t started your Black Friday preparations, don’t worry, it’s not too late! Here at Burnthebook we believe it is always better to plan in advance for optimal results, therefore we have some useful last-minute tips on how to maximise your potential even for the future Black Friday events. Black Friday provides the opportunity to create buzz around your brand and a way to get your products noticed. So how do you stand out from the thousands of offers? Customers are in the mood for buying during the festive season, with some retailers making up to 40% of their yearly revenue in the last quarter alone. £1.74bn is the predicted online spend every minute this Black Friday so make the most of it by regularly reminding customers of your seasonal offers. Do you only simply publish offers on the day to generate these sales? Of course not, that’s the trick. Black Friday is still a day-event however competitiveness has transformed it into a week of shopping, amazing right, how do you think Cyber Monday came around, one day simply wasn’t enough for not only consumers but businesses too. Many retailers promote offers and discounts a whole week before and closely after the event simply to stand out from the competition. You need to do something similar, make your offers engaging, you need to swoop those bargain shoppers who are sitting at their desks or at the shopping centres desperately waiting and anticipating those exclusive offers off their feet. We advise to execute a simple marketing plan that clearly outlines what you want to achieve from Black Friday. As a result, a well thought through digital strategy can positively impact sales, customer loyalty and brand awareness ultimately influencing potential growth. If your marketing efforts are a success, then you should see a significant increase in traffic to your website, however you don’t want this to cause your site to crash and therefore lose out on sales. Our advice is to contact your web service administrator beforehand and advise them on the potential escalation in traffic to your website. They can then plan, advise on how you can cater for this increased traffic and optimise eCommerce site speeds for better search engine ranking, a responsive eCommerce design for a comfortable smooth customer shopping experience to increase sales. Many retailers including retail giants John Lewis and Argos have ensured they have prepared for the large amounts of traffic coming into their websites by investing in technology and delivery network upgrades to prevent crashes as they experienced in the 2015 event. Approximately one in five retailers experienced website crashes. It is always best to plan campaigns well in advance, looking at all of your products and creating a schedule of the dates particular promotions will be launched. This will enable you to feel organised and in-control in planning graphics, social media content and email copy. But remember, one of the most important parts of a campaign is analysing its results to see where your successes lie. If you have previously delivered promotions this year, look at which had the highest click through rate and look to replicate something similar for Black Friday. As well as prepping your website and planning your campaigns, it’s important to ensure you have the correct resources on the day and throughout the week. You don’t want your website to crash, but you also don’t want your customers leaving your site if they’re not able to get the assistance they require. Integrate a live chat system for the weekend, being on hand to help with any customer queries. This won’t just assist with your increased sales, but will also illustrate your standard of customer service, enticing new customers to visit your website again. Make sure your phones are well manned, offering extra support to customers. This year’s Black Friday is expected to break previous records, approximately £180m is predicted to be spent on the event’s deals per minute, do you know how many transactions that must be in a minute, do you even want to calculate it, it’s overwhelming. Therefore, to gain the most from the day, extend your promotions and be prepared a week in advance of Black Friday up until just after the Cyber Monday event even. We advise exercising your social media channels, drawing traffic from these platforms, directing them to your website. Consider promoting your seasonal offers through themed graphics on your home, product and event pages. Change the header on your Social Media pages, tying in with the new designs on your website. It is important that you remember your page represents your brand, so don’t cheapen your profile with brash graphics and tacky design. Your promotions should be catchy and in keeping with your brand. Also remember that social media is now seen as a form of customer service, so monitor your Direct Messages and stay on top of mentions and shares. Ask your customers and followers to tag friends in your posts, therefore drawing in a larger audience for your promo. Offer rewards to new followers, or current customers that share your post. Throughout the day, or entire week, have a new promotion every few hours, therefore engaging with different customer needs, and a variety of offerings will entice a new audience each time. Utilise Instagram’s new Story feature to share your updated offers throughout the day. One way to analyse your success on social media is to offer exclusives to each channel, helping you direct your Black Friday efforts for next year. Consider which group of followers you gained the most sales from, resulting in a clear picture of where you should focus your efforts. Black Friday not only opens the doors to new traffic, but also serves as an occasion to reward loyal customers. An email campaign sent to frequent customers can offer them a promo code, or a gift with their next purchase, as a reward for their loyalty. These rewards can be extended into the week to further encourage repeat business and customer engagement. Email Marketing proves to be crucial for Black Friday as it reports 25% of online transactions. It has been deemed a key driver to not only building awareness but driving sales both in-store and online. Black Friday shoppers are increasingly moving from offline to online channels and therefore it’s essential to create compelling email campaigns. With time not being an asset, emailer campaigns don’t have to be fussy. Speak to your design agency about creating engaging templates that can be used for multiple email campaigns. Schedule emails to be sent out throughout the campaign period and ensure they are optimised for multiple devices just as your website should be. 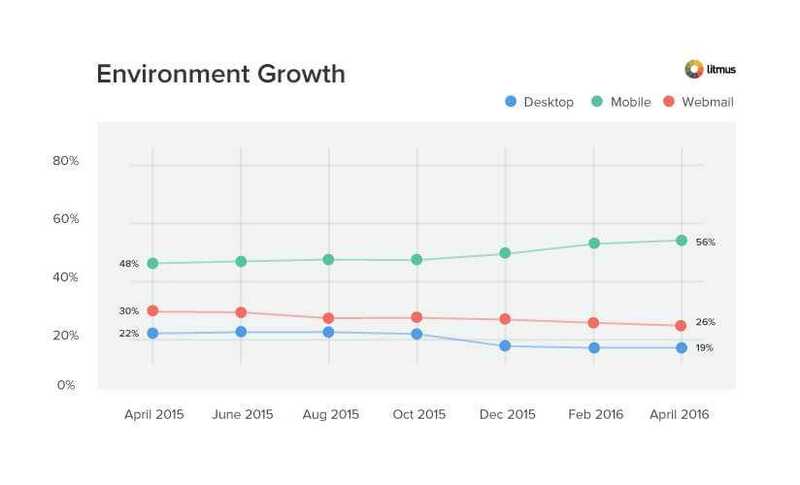 According to Litmus the device chart below shows that mobile calls the shots displaying growth of 56% up till last year, being the most popular channel to shop online with. Since mobiles have become the most convenient devices held in shoppers’ daily lives, email campaigns and Black Friday seem to be a match made in heaven as offers are published directly to customers. Customers can shop on-the-go and be kept updated throughout the day through push notifications. Ensure your Email Marketing is mobile friendly, as we anticipate this to continuously develop as rapid technology innovation creates communicational breakthroughs. Try send those Black Friday offers slightly a day or two earlier or later to avoid getting lost in the crowd and being ignored as shoppers expect a flood of emails on event day. According to GetResponse 57% of email marketers were predicted to increase their budgets last year and 33% were found to not optimise their emails. 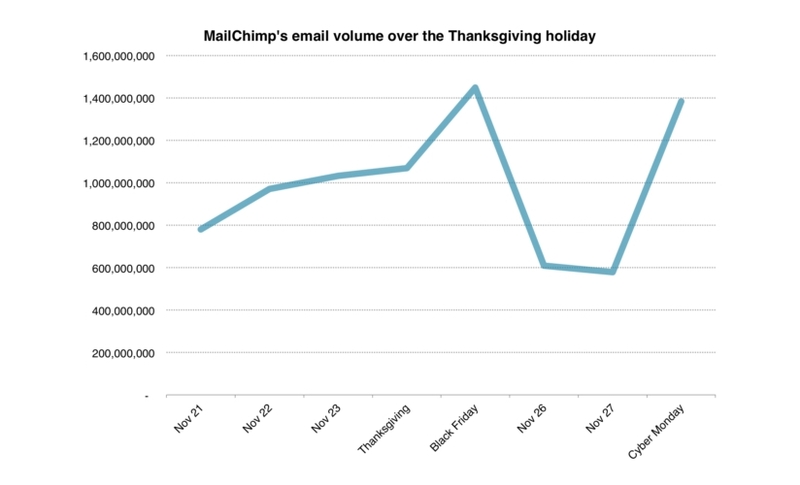 MailChimp mentioned that their users had sent a record-breaking 1.5 billion emails which saw their sales figure reach over $90 million on the event day as seen below. We are going to be honest, Black Friday emails do promise higher open and conversion rates however the ball is in your hands, do you want to shoot or pass the ball off waiting for another chance that may not come around until next year? We highly doubt you’d want to give up those points, therefore ensure you create hype behind your offers, use clear call-to-action links, optimise for multiple devices and make your campaigns unique but consistent with your brand. A large proportion of your target audience will start their search on websites dedicated to deals. Popular choices include Vouchercode, Vouchercloud, HotUKdeals and Topcashback. Groupon is a great place to push your products, offering them at a subsidised price, but to a substantially large audience. You could also target students through UniDays and NUS. Make sure you post your promotions on at least one of these websites to gain further brand exposure. Google shopping is another way to successfully push your promotions. When using search engines to start their online shopping, 52% of customers click through Google Shopping results or Product Listing Ads (PLA) instead of going directly to brand sites or searching on Amazon/eBay. For you to achieve the best results here, place your most important keywords at the front of your title. Hopefully, you should now feel well prepared and have a clear idea of how to manage Black Friday. This is just an insight and some ideas, and it changes per business industry. Remember, if you are considering a big marketing push, make sure you can deliver. Have extra support in place, from staff answering the phones, to a disaster plan ready with your website admin, order in more stock, update your social media constantly and make sure all hands are on deck to deliver exceptional customer service over the Black Friday.